Hartford Hospital Nursing is a publication of the Hartford Hospital Department of Nursing and the Alumnae Association of the Hartford Hospital School of Nursing. 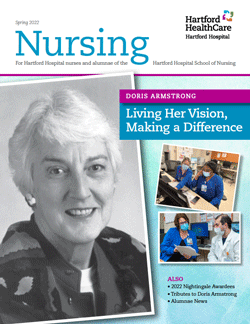 The magazine highlights the activities and achievements of the Hartford Hospital nursing staff and alumnae of the Hartford Hospital School of Nursing. Their stories are told through a variety of articles and news items focusing on the key areas including practice, education, leadership and research. Hartford Hospital is a teaching hospital in every sense. We offer a broad array of education programs from fellowships and residencies to EMS training.